It's a known fact that plants need water and sunlight for their survival. An excess or deficit of them will result in causing the unexpected. You should water your plants carefully; here is a listing of logic, why? There is two known logic behind, wilting of plants. One is the scarcity of waters in the system other being an excess in presence. Wilting is an unwanted phenomenon, and anyone would like to avoid anyway. 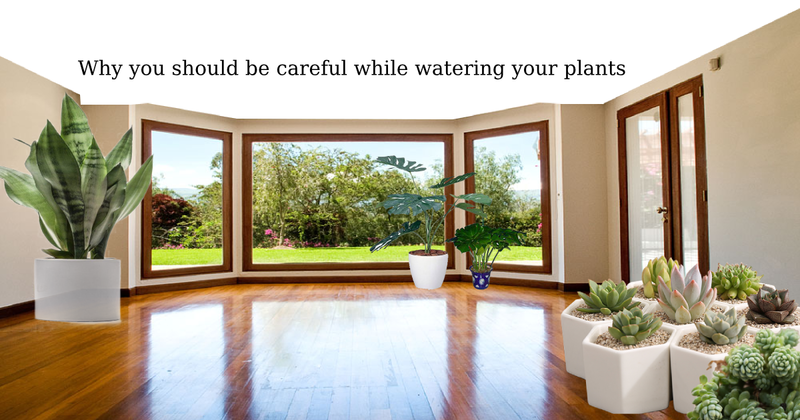 Water your plants carefully to avoid any mishaps. One of the primary sign observed while watering the plant too much is discoloration of leaves. The Chlorophyll on the surface gets completely destroyed. It hampers the life cycle of plants drastically. Brown is the general color noticed in such leaves. Carefully observing the water requirements, and providing the same is the best way to rule out, any such problem. Each plant has different water desires, understand the type of your plant and plan accordingly for it. Just like humans, plants retain water in their system. Remember the last time you felt bloated and full? Yes, the same happens with plants too. Oedema is an unfavorable condition experienced by plants in their life cycle. You need to find the root cause behind such an occurrence. The most common symptoms of this illness are blisters and change in color of leaves. Plants often die, and wilt, in the process. Timely fixing of the problem is the greatest measure one can exercise for its well-being. Another common occurrence in the species is the yellow coloration of the leaf. There are a couple of reasons for the event. The plant has too much moisture in its base; make sure that the hole in the pot is reasonable enough to discharge any excess water from the soil. If the plant is in your garden, check the moisture content of the loam there, it must be high! Another reason for such an event could be a scarcity of sunlight availability for its proper functioning. The temperature condition of the surrounding also plays a role in yellow coloration of leaves. Too hot or cold is equally polluting in nature. Too much or too little is responsible for falling of leaves. If you notice, young leaves are falling abruptly, and the buds of flowers are not opening. It's probably time to take matters precariously! Sticking finger on the soil and pushing it downwards is an effective way to see the moisture content in the loam. Technology and its advancements have led to numerous innovations. Purchasing planters online is fabulous in terms of saving time, and price rates, are concerned. Make sure to buy the one that has proper drainage for plants. Plants are useful living things supporting the existence of humans in the crust. You can add fertilizers and organic manures in the soil for healthy germination of plants. The food making process in plants prioritizes in including sunlight and water in the cycle.